Having provided the scene-setting opening track on Aaaaargh!, Realicide return to Digital Vomit with this exclusive live set recorded in June 09 in Chicago (as part of the March-August 2009 tour in support of their "Resisting The Viral Self" LP/CD released via Realicide Youth Records). If you don't already know what Realicide sound like, imagine a US version of Atari Teenage Riot - and just like ATR, this is raw gabba combined with proper punk attitudes, which means they're not just noise-for-noise-sake (much as we also love that kind of stuff in DV), but also provide their own searing social commentary through their lyrics, zines and essays. So if you like your extreme electronic music to be thought provoking as well as straight up in-your-face, go download this now. 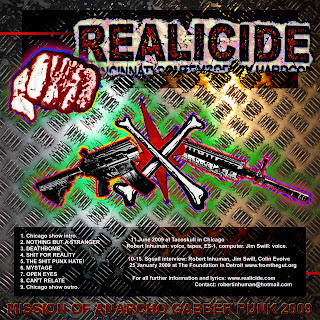 Capturing Realicide in their element, Mission of Anarcho Gabber Punk 2009 does what it says in the title, bringing together a incendiary live set with edited interview highlights expanding on Realicide's social aims and agenda.